A grandson was over the other day and asked if we could make Frankenstein cookies with my new cutter. Of course I said "Yes"! Since he wanted to decorate them and he just turned five, I thought it would be easier (and quicker) to minimize the frosting, so I colored the dough (as opposed to using royal icing as the green base). By doing so, we were able to jump right into adding the fun details! And fun it was! On some of them I added noses made from dough, before baking. On others, I added green or purple gumdrop noses after the cookies were baked. Super simple! Nearing the end of baking, I had a small amount of dough left, so made some mini monsters. A rectangle petit four cutter was used, along with tiny candy eyes and mini m&m's for the noses. My grandson did a great job decorating his cookie (he only did one:)), but ate it up rather quickly before I could snap a photo. He added black sanding sugar on top of the black details. 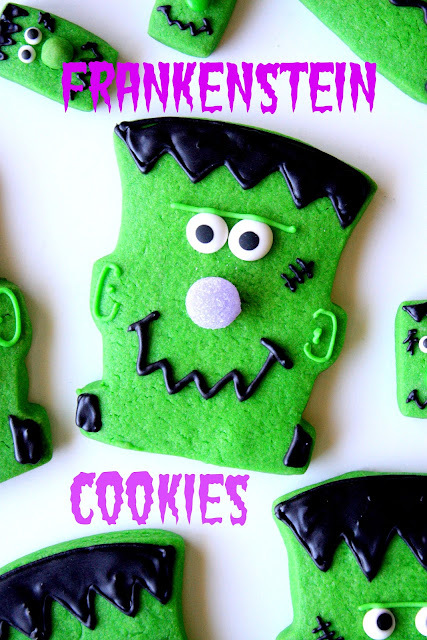 Would you like to make your own green Frankensteins? 1. While mixing your dough, add some green food gel (I used Wilton Leaf green), until you achieve a shade to your liking. 2. Using a Frankenstein Cookie Cutter (or large rectangle, as I did here), roll out your dough and cut out your cookies. 3. With a small amount of dough, shape a small round ball (or another shape) and place on cookie as the nose (if you are making a dough nose). 4. After the cookies are baked and cooled, use the black tinted royal icing for the hair, mouth, scar and bolts. 5. Use some royal icing tinted with green gel to detail the ears and brow. 6. Using a small dab of royal icing, adhere the eyes and nose to the face. If you'd like to use royal icing to decorate the green monster, visit Sugarbelle's fabulous blog to get it just right! Great idea! Perfect for those, like me, who like more cookie, less icing. Super cute! 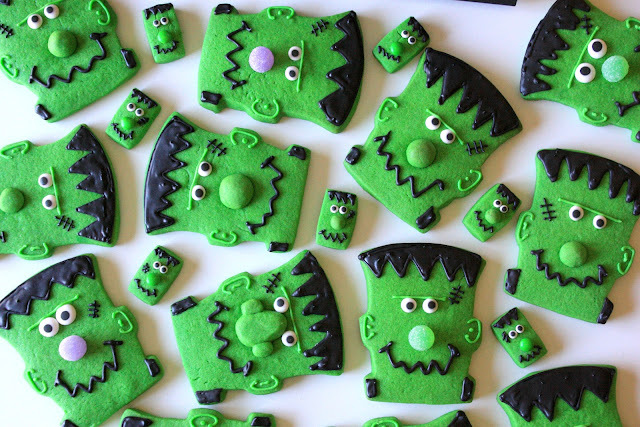 Who doesn't love a green cookie--these are so cute! I will be enjoying these for sure as they look easy to do and so cute and fun, thanks Sue - and that spider cake...well, it is just the cutest darn thing ever!!!! What a cool idea to dye the dough. That'll make it so much easier to decorate with my kids. Love the cue Frankensteins too. How much fun! And you are right coloring the dough works well for these. love them! such a vibrant green too! Love 'em! I totally agree that sometimes simple is nice; a pinch less sugar is good; one less frosting to dye is lovely. Plus, they lose nothing in cuteness!! 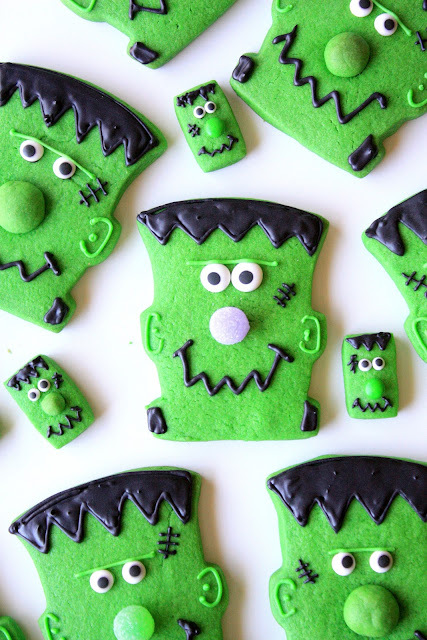 Sue, your Frankensteins are adorable!!! I bet your Grandson had a blast baking with you! Love those colored cookies and no one will have a green mouth after eating them! Sounds like such a fun day!! Every single one of them is cute. I love the idea of cutting down on the sugar. This is a great idea. My daughter just asked me who Frankenstein is! Now I'll have something cute to show her! Love these green heads! They are so cute!Love how you made the dough green! Very smart! So much fun! I love the shade of green! Those are so cute! I love everything about them. My 4 year old would love to make them. That's a good idea to dye the dough green, hope you had fun making these with Zeke! Oh my these are adorable...wish I had more time to bake in the kitchen...I would love to make these. FUN! I so love coming and visiting you. You really do inspire me. I love these, they are so fun! My granddaughter would love making these. Thanks for sharing.